Please allow me to swoon before I announce today's giveaway! Okay, much better! Today's giveaway is brought to you by Cat from Uncorked. 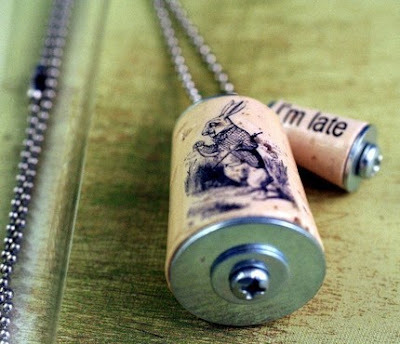 She is a featured seller on Etsy and her whimsical cork necklaces are all the rage right now! She is offering up a very special Alice in Wonderland necklace for Haute Whimsy readers, so show her some much deserved love by visiting Uncorked and coming back here to talk about her beautiful designs! A winner will be chosen at random tomorrow! Good luck! *Congratulations to our lucky winner, Gerry! That necklace makes me smile! Adorable. That would be a good gift to announce a surprise pregnancy too! What a sweet, simple idea - but they're so gorgeous! I love it!!! I love these! Such a neat idea! Oh I just love it and so much cooler than making a message board out of them. I think it is awesome. How original to use corks. I love the "Swinging from chandelier". I also love her "polarity" store on Etsy. I have bought several of her necklaces for gifts. Thanks for the giveaway. 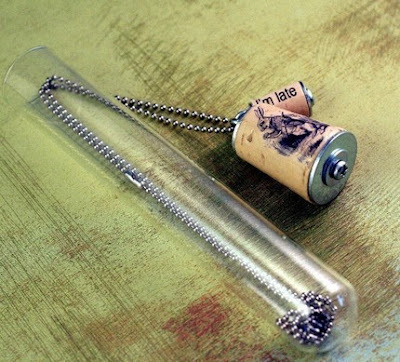 I live in mid-Missouri and this is the very first I've heard of 'cork' necklaces, guess we're not in the mainstream of fashion. Oh- I really really really want to win this one! I'm so glad you introduced me to her etsy. They are all so unique and would make perfect special birthday presents for friends and family. I tend to be late for everything so I laughed when I saw the giveaway necklace. these are so cute! i really liked all of the ones i looked at and the fact that they come in a test tube, ready for you to "cork!" So cute! I love this necklace, as well as the Halloween Recycled Magnetic locket set from the store - very cute and festive! ooooo me likes!! i just got ur ad email i am interested!!! Those are amazing!! HOw does she do that!?? I want one. I love the retro images she uses as well. OMG, I'm this week's winner? Thank you Jen, for the opportunity and fun this giveaway has provided. I'm so happy to have found your blog.